Platinum Elfa 3' Back Stop Bar is rated 4.7 out of 5 by 13. Rated 4 out of 5 by Busybrain from Nice way to add magnetic storage to my desk! I devised a treadmill desk using Elfa components and wanted more ways to pin up notes so I added a couple of these to my setup. They are sleek looking, and I can put magnetized mesh baskets (small ones) on them too. I have a nice view I didn't want to block so these are perfect since I can still see between the strips. Easy to put into the shelf standards too. (I used the freestanding components to create the desk, which works beautifully). Rated 5 out of 5 by 1stmamallama from Perfect solution for freestanding shelves These solve the problem of things being pushed too far back on Elfa freestanding shelves and falling down the back. The also serve to keep those pesky cords pushed down. Well worth their slight cost as that perfect finishing touch. If you are using freestanding Elfa as a room divider with shelves on both sides these are a must have for each side and each row of shelves! Low cost for a great solution! Rated 5 out of 5 by kimi from Great for sewing room!!! I got these to use in my sewing room. i put them on my 84" standards and draped my folded fabric over them. I can see all the fabric and know at a glance what I have available! I highly recommend this product!!!! Rated 3 out of 5 by YankeeSierra from You will need a glue remover It fits perfectly and makes the shelves look good. However the label stickers do not come off as easily as on the rest of the merchandize. Container Store should either change the glue being used on the stickers or provide a packet of glue remover with these pieces. Rated 5 out of 5 by TexasMom from Best Magnet Bar These make the best magnet bars. In my study, I stuck a couple over my elfa desk to hold notes. In my daughters' room, I have a set of 4, placed under their elfa shelves, to hold artwork. The nice thing is that you can use these bars with any type of elfa shelving, not just the freestanding kind. The upright bars just have to be 2 feet apart. Rated 5 out of 5 by rocean from Great to hang pictures and notes. 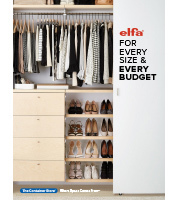 I have the Elfa shelving system. The one wall has the desk with shelves above it. I use the back stop bar with Magnutz's to hold notes. The other wall has shelves around a lateral file with printer on it. I rotate pictures of family on the back stop bars with Magnutz's. Rated 5 out of 5 by medoitmyself from greatest purchase this is the greatest! I have several in my craftroom and I hang my punches on them. I have some mini magnets and I tack little notes to it in the office. It keeps everything evenly lined up. Rated 5 out of 5 by diamondgirl from Critical Piece The backstop bars are critical - now we can push books and videos all the way back against the stops and even put a second row onto the shelves if need be! Is this available in 30&quot;? Is this available in 30&quot; length to match with 30&quot; shelves? This product only comes in 24'' and 36'' to compliment our ventilated and decor shelves. Will these fit over top of standards? I'm planning a space that has 18&quot; spacing on the standards, and was wondering if i could use a 36&quot; long back stop bar. So it would be mounted on the end standards but have to sit over top of the middle one. Our elfa Back Stop Bar must be placed between (not over or behind) Hanging Standards or freestanding Uprights spaced at 24&quot; or 36&quot; increments. How to use with 30&quot; solid shelves? I've just installed a 60&quot; set of Elfa shelves over my desk (i.e., two side-by-side 30&quot; shelves, hung with three standards). I'd like to purchase a couple of backstops for the shelves, but I gather that they aren't available in 30&quot; lengths?? And with the hooks on the two ends, I assume they can't be cut to size the way that the top tracks or hanging standards can be. What to do? Unfortunately we do not carry the backstop bars in a 30&quot; width, they currently only come in 24&quot; and 36&quot;. How wide are these bars? I see you can get them in either 2 or 3&quot; heights, but it doesn't detail how long each one is so I can space shelf support bars at the appropriate distance before receiving them. The dimensions listed refer to the width of the elfa Back Stop Bar, side to side. They come in 2 feet and 3 feet widths.